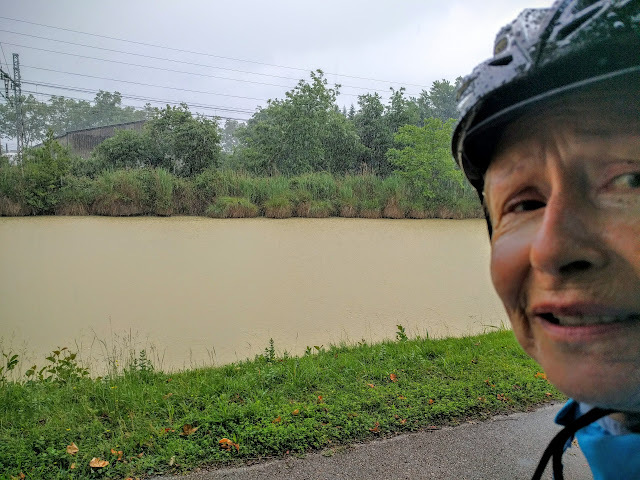 92 kms on the Canal de Deux Mers in the rain. Today's cycle ride had one characteristic that overwhelmed all others. It was very wet. 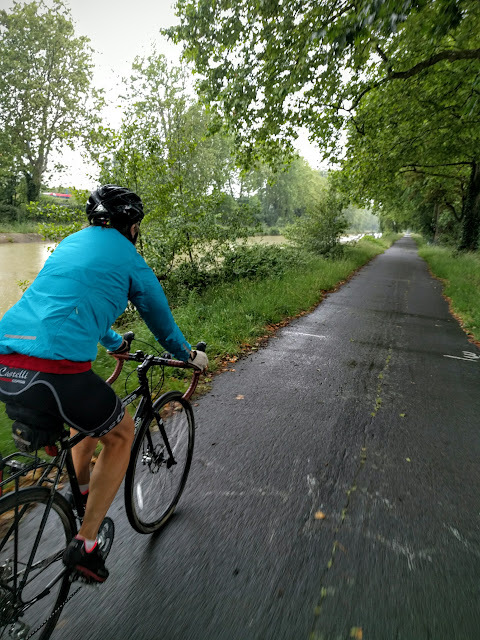 It started to rain as soon as we left the chambre d'hote in Donneville and kept raining for the next 82kms. The rain varied from steady drizzle to torrential. We've had a difficult day! There were some plus's however. Firstly the track was perfect. 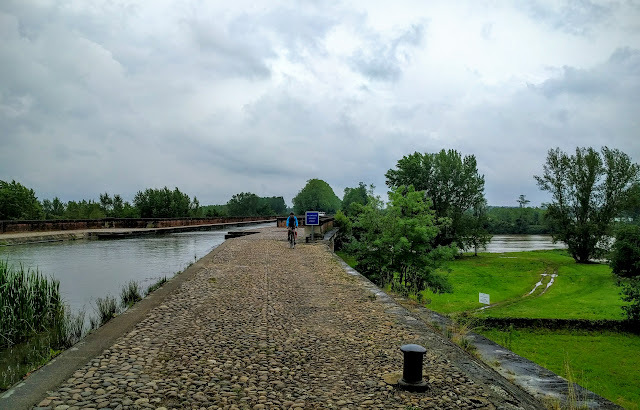 The excellent surface which we experienced yesterday afternoon is now standard (major tempting fate standard), and it continued all the way to Moissac. We belted along this track in the pouring rain. 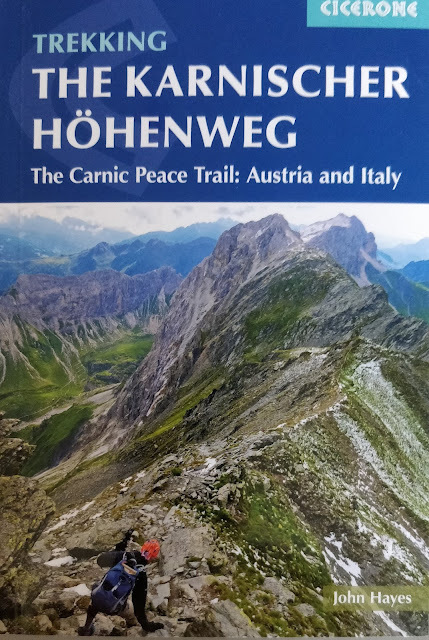 Unfortunately the I'd underestimated the distance by 12kms which spoilt the effect somewhat. Secondly the countryside was seriously dull. The huge factories ringing Toulouse (they still make things in France) lined about half the route and until the final approach to Moissac the rest was poor. If you're going to have a bad weather day this was the countryside to have it in. You could just keep your head down and let the rain drip off your cap. Thirdly we made the right decision not stopping in Toulouse as finding a hotel in last night's rush hour would have been a nightmare. On the other hand getting across the city and changing canals in the process, following a brilliantly marked cycle route, was a piece of cake. Fourthly Christine, after 3 days of badgering, has finally conceded to the wisdom of the picnic. 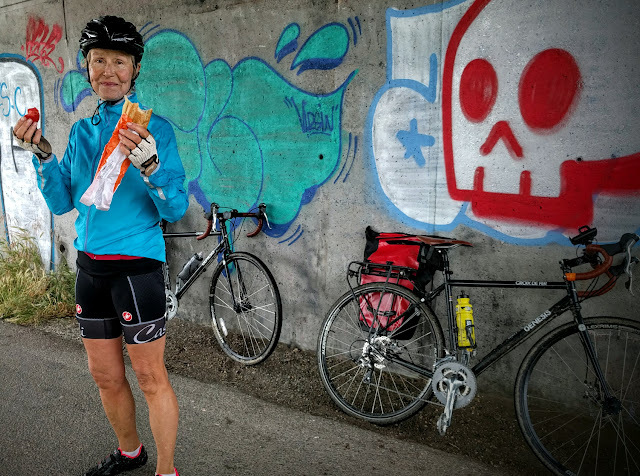 Today, instead of searching for what would probably have been an elusive restaurant, we bought tomatoes, snickers and premade sandwiches (fresh baguettes) and adopted a three stop strategy eating under bridges. Actually we stopped at a lot more than three bridges and the day consisted of dashing from one bridge to the next sheltering each time to avoid the monsoon blasts of rain. A number of bridges had little groups of cyclists cowering under them. Finally on arriving in Moissac we quickly found our hotel and it turned out to be a gem. Huge room, giant bath and best of all a kettle with tea bags. Today could definitely have been a lot worse! Moissac is at the confluence of the rivers Garonne and Tarn and our route enters the town along a dramatic aqueduct over the Tarn. Because we got there early we had enough time to do some sightseeing. 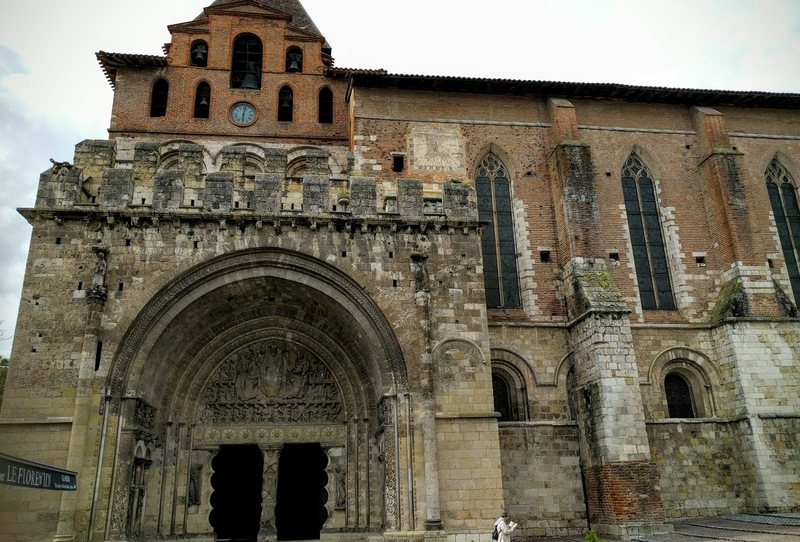 Moissac has a lovely although slightly run down medieval town centre the star of which is a beautiful Romanesque (Norman) abbey. The abbey still has some resident nuns. 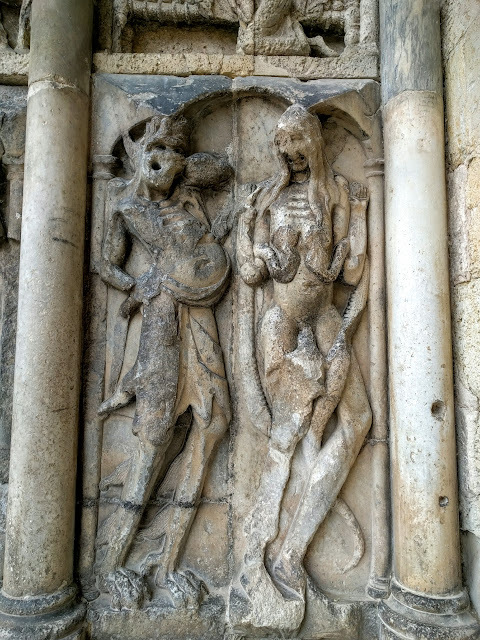 The 10th century statues around what is an amazing main arch provide them and the rest of us with reminders of the consequences of misbehaviour. Scary!